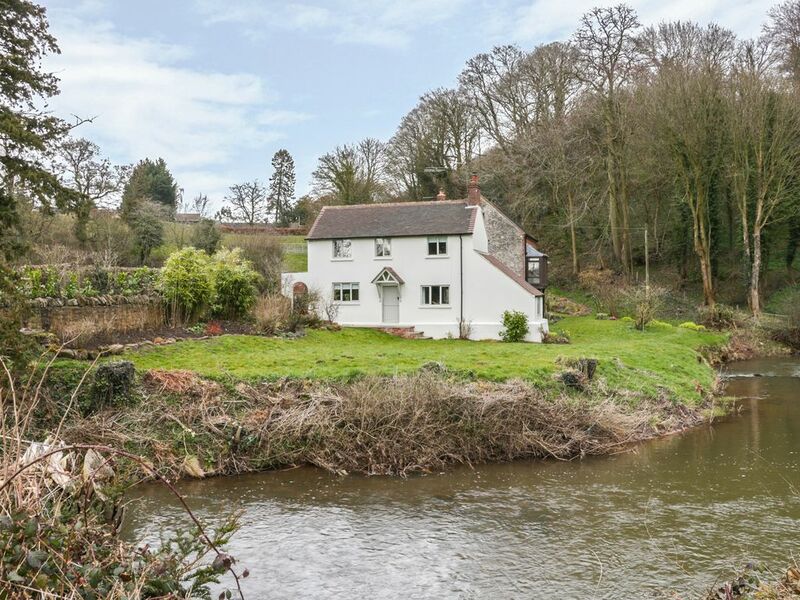 This former corm mill cottage is situated five miles from Cleobury Mortimer in Shropshire and sleeps five people in three bedrooms. Prescott Mill Cottage is a former corn mill, located in the Shropshire countryside, five miles from Cleobury Mortimer. This cottage comprises of one king-size double and two twin bedrooms, one of which is on the ground floor, and both can be made into double beds, there is also a family bathroom, the property can sleep five people. It also comes with a kitchen/diner and a sitting area with multi-fuel stove. To the outside there is ample off road parking and a garden with river frontage and furniture. Prescott Mill Cottage is a perfect cottage for those that want to enjoy the Shropshire countryside. Amenities: Night storage heaters with woodburner. Electric cooker, microwave, fridge/freezer, dishwasher, TV with Freeview, DVD, WIFI can be picked from the owner's home. Electricity and starter pack for woodburner inc. in rent. Bed linen and towels inc. in rent. Ample off road parking. Secluded garden with river frontage and garden furniture. Sorry, no pets and no smoking. Pub and shop 1.5 miles. Note: Property prone to flooding at times but has Environment agency fitted defence system. Note: River next to property is unfenced, children must be supervised when outside at all times. Note: WIFI is available/can be picked up from the owners property close by, however the signal may be weak. Note: The property is not be suitable for those with limited mobility. Note: This property sleeps a maximum of 4 adults and 2 children. Region: A E Houseman once wrote that Shropshire was "the quietest place under the sun" and today the county remains something of a rural idyll, recognised as one of the least crowded and most peaceful regions in England. Town: The village of Stottesdon lies in the wonderful Shropshire countryside between historic Bridgnorth and Ludlow. The village offers a small shop and a pub, while within easy reach are attractive Shropshire towns and villages such as Shrewsbury, Church Stretton and Much Wenlock. Three bedrooms: 1 x double bed with en-suite shower room, 2 x twin (one on ground floor). Shower room with shower, basin and WC on the first floor. Kitchen with dining area. Sitting room with woodburner. Night storage heaters with woodburner. Electric cooker, microwave, fridge/freezer, dishwasher, TV with Freeview, DVD, WIFI can be picked from the owner's home. Electricity and starter pack for woodburner inc. in rent. Bed linen and towels inc. in rent. Ample off road parking. Secluded garden with river frontage and garden furniture. Sorry, no pets and no smoking. Pub and shop 1.5 miles. Note: Property prone to flooding at times but has Environment agency fitted defence system. Note: River next to property is unfenced, children must be supervised when outside at all times. Note: WIFI is available/can be picked up from the owners property close by, however the signal may be weak. Note: The property is not be suitable for those with limited mobility. Note: This property sleeps a maximum of 4 adults and 2 children.